Climate Justice Activists Shake Up The Financial District in Toronto! In solidarity with the La Via Campesina’s International day of a 1000 Cancun’s, Environmental Justice Toronto and allies, in partnership with the Indigenous Environmental Network, shut down Bay Street in the heart of Toronto, Canada’s financial district. Climate Justice activists erected tri-pods in the middle of the intersection effectively stopping traffic. 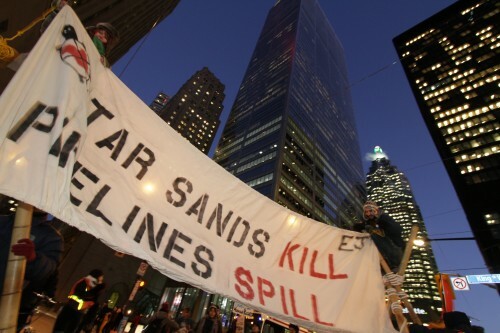 A banner was hung between with the statement, “Tar Sands Kill, Pipelines Spill,” drawing attention to Canada’s greatest greenhouse emitter. More than 100 migrant rights, union, anti-poverty, gender equity and climate activists gathered at Nathan Phillips Square in the Toronto financial district, to express solidarity with the La Via Campesina’s International Day of a 1000 Cancun’s and with the many grassroots organizations mobiizing in Cancun. La Via Campesina, a north/south farmer’s coalition for food sovereignty, sustainability, gender equity, and social justice, is campaigning against false solutions such as REDD [Reducing Greenhouse Gas Emissions from Deforestation and Forest Degradation]. Alberto Gómez Flores, representative of La Via Campesina for the North America region, said: “It’s a disgrace that the United Nations space intended to tackle climate change has been converted into a platform to legitimize the commercial strategies of transnational corporations.” Local organizers emphasized that racialized/indigenous people, women and the poor are disproportionately affected by the extractive industry, which often displaces whole communities, leads to increases in sexual violence and gender inequity and sabotages local economic activities such as subsistence farming. A dozen cities across Canada have responded to the Via Campesina’s call for climate justice. These groups point to Canada’s lax regulation and exploitative policy that further endanger the environment as well as the safety and livelihood of the earth’s people. The Latin American and Carribean Solidarity Network condemned Canada’s failure to pass Bill C-300, a bill that would regulate mining companies’ activities abroad by withholding government investments and the undemocratic defeat of Bill C-311, meant to address climate change. Other issues raised at the rally concerned Canada’s continued negligence of local food security for poor people, the harmful consequences of the Tar Sands project, the privatization of water, and the need for supportive migration policy to respond to the environmental refugee crisis created by Canadian foreign policy. Canada’s climate negotiations in Cancun, which has been described as an “excuse for inaction” by environmental think tank groups is not likely to change Canada’s reputation. It has been reported that Canada, a long with only Russia and Japan will fight to vote down an extension of the Kyoto Protocol. Canada has yet to meet their previous commitments made with the Kyoto Protocol to decrease emissions and instead, their levels have increased by 24% since 1990.